A little bit louder now...: Limetastic Ladies! I love alliteration. And I love even more when you see something in real life that makes you think that you just fell into a Dr. Seuss book. Yesterday I was having my own Sunday Fun Day in Park City when I turned the corner and saw two Lumberjack Lesbians disguised as Lipstick Lesbians. Both wearing a shade of lime green that is the brightness equivalent of hunter orange. Both lovely. Both made my day. 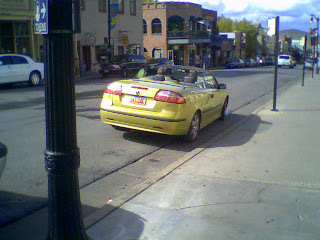 Then they both hopped into their lime green Saab. Do they always wear lime green? Or do they have a car that matches every color that they wear? Are they paid advertisements for Sprite's new subLYMONal advertising campaign, or are they from the future? Either way, it is genius and it made me want to have a lesbian lover when I grow up. I really wish I were quicker on my thumbs and knew how to work my camera phone so you could get the real picture of this. Have you ever seen anything so great? I haven't. I have cars according to my clothing choices. My favorites are periwinkle and puce.